An award-winning high-yield farming system developed by young entrepreneur is currently being trialled in Wales. 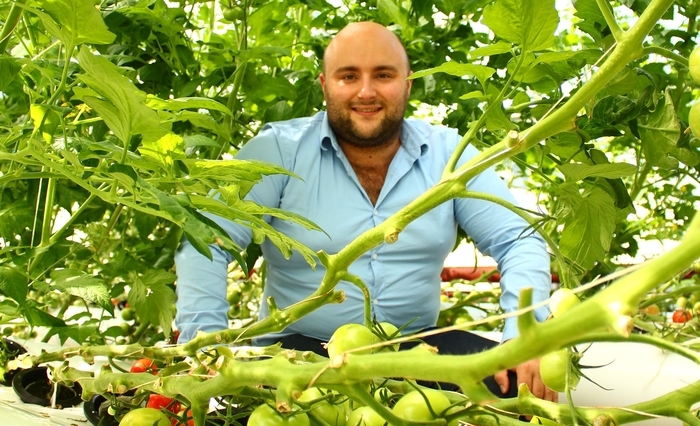 Entrepreneur Adam Dixon, a Cardiff University School of Engineering graduate, has teamed up with Aberystwyth University to grow two tonnes of tomatoes in a small greenhouse this summer, using his patented Phytoponics system. Phytoponics is an agricultural start-up co-founded with Luke Parkin and born out of Adam’s hydroponic hobby. The trial is designed to show investors the potential of the system, which produces high yields and uses 10 times less land and water than other agricultural processes, with no use of pesticides and herbicides. Harvesting will continue into November with plans to upscale to a commercial-size pilot farm following completion. Described as a ‘Jacuzzi in a bag’, the Phytoponics system rolls out and inflates to provide a safe haven for a range of commercial plants, from salads to vines, growing plants very fast. The sealed unit delivers nutrient-rich water to roots through an integrated aerator whilst keeping moisture in, and pests out. Adam said, “Taking a small 50m2 greenhouse to grow two tonnes of tomatoes in 6 months is a great accomplishment, but I think in Wales and the UK we need to produce much more if we are to become self-sufficient in growing our own fruits and vegetables as a country. Phytoponics and Adam have already clinched a string of awards including Innovative Start-Up of the Year at the Wales Start Up Awards 2017, UN Young Champion of The Earth for Europe 2017, and the Shell LiveWIRE Smarter Future Award 2017. This year, Adam is one of three UN Young Champions of the Earth to be selected as a Climate Trailblazer in the run-up to the Global Climate Action Summit, which takes place in San Francisco later this month. The Climate Trailblazers have been chosen from around the world and reflect the global nature of the Global Climate Action Summit, which aims to bring together the best in international climate change activity. Adam, who has proved himself as an emerging voice with a passion for climate issues, has been chosen to represent Europe and is spreading awareness of the Summit’s ambitious goals in the lead up to the event; showing that passionate, everyday people can do extraordinary things if they choose to act. The first harvest of tomatoes (Roma Returno) from the trial has been sold to local customers including Chef Matteo Monacelli, from the Royal Pier, Aberystwyth.